It's no secret that making ethically responsible choices, as much as possible, about the food that I consume, is a subject which is dear to my heart, and is indeed one of the founding principles of this blog. 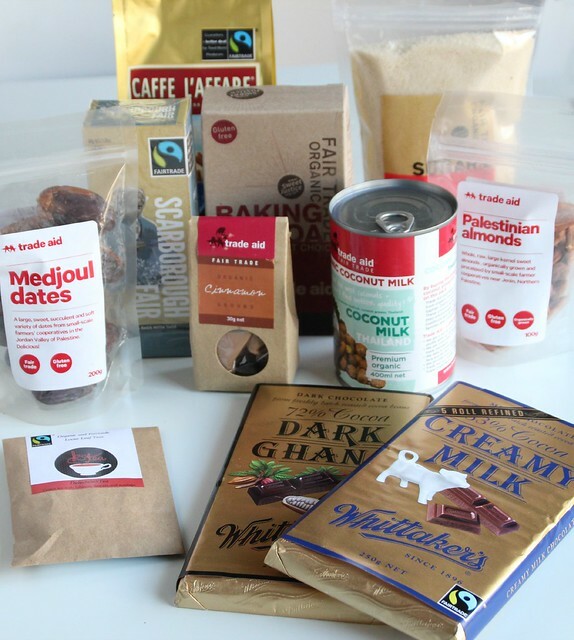 As such I regularly use Fair Trade products - they are always exceptionally good quality and Fair Trade principles are consistent with my own food philosophy. 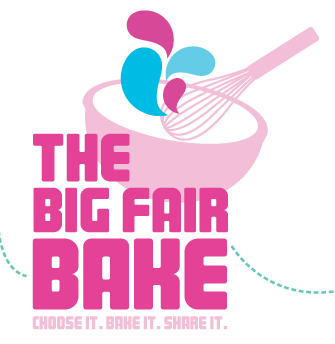 So I was pretty excited a couple of weeks ago then, when a nice big hamper of gorgeous Fair Trade goodies turned up, along with an invitation to bake something delicious and join in this year's "The Big Fair Bake" event. What you don't see in the photo, is a bunch of Fair Trade bananas, which, by the time they had traveled for a couple of days to get to me, were a bit riper than I like to eat them. So it seemed inevitable that they would be included in my recipe. I started thinking banana cake, but to be honest I generally prefer banana bread - it usually keeps well for several days, and makes a great snack or breakfast on the run. Once I got to thinking about adding in some dates and dark chocolate, I knew this would elevate my regular banana bread to something really special. Preheat oven to 160 degrees C (325 degrees F). Lightly grease a 23cm x 13cm (9" x 5") loaf tin, and line with baking paper. In a medium sized bowl mix together coconut oil and sugar, then add the eggs one at a time, beating well after each addition. Stir in the vanilla. Sift together the flour, baking powder, baking soda and cinnamon. Add to the wet ingredients, and mix until just barely combined. Add the mashed bananas, golden syrup, dates and chocolate, and once again mix until just combined - take care not to over mix. Spoon mixture into the prepared tin, and bake for 60-65 minutes or until a skewer inserted into the centre of the loaf comes out clean. Cool in the tin for 20 minutes before turning out onto a wire rack. Allow to cool completely before slicing. I will also be submitting this post to Sweet New Zealand. 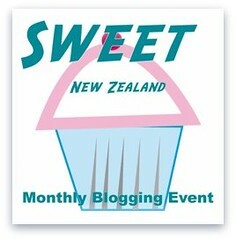 Inspired by Alessandra Zecchini, and hosted this month by Libby at Ditch The Carbs, Sweet New Zealand is an event for all Kiwi bloggers (whether living at home or abroad), or all foreign bloggers living in New Zealand, to link up their sweet treats. Great idea adding dates to banana bread. My niece lives in Auckland, and after trying pumpkin pie when visiting me, she wanted to make some at home. She had to go to a specialty food store to find some canned pumpkin. She said it was well worth the effort and expense. The pumpkins in NZ are really nice, though not as sweet as the canned pumpkin here, but should work just as well. Canned pumpkin is quite thick. I agree with you, Sue. I try and buy Fair Trade whenever I can. It's always worth the wee bit of extra expense for a good product and one I can feel good about purchasing. This looks good, love the flavor combos and I would seriously demolish half of that loaf right now. We have stores here called World Market and I often find Fair Trade products there. Great post! Wow. I would never have thought to put dates in banana bread. I'll have to try that the next time we have too ripe bananas! It seems like I haven't bought any in ages! Wow I would have never have thought to add dates to banana bread. I'll have to try it next time. Sounds yummy! 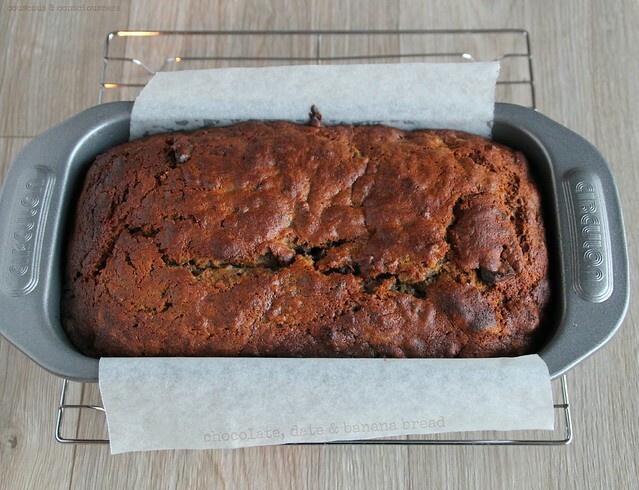 This banana bread looks sensational and I love it refined sugar free! I try and buy free trade as well, more and more shops are carrying those products, so more and more people must be buying. Love this recipe, adding the dates was very clever, love it! 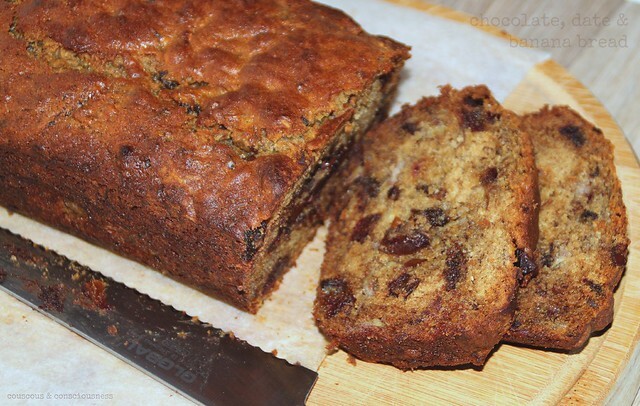 Love banana bread and fair trade so delighted to see this recipe from you. Yum. On this slightly chilly Sunday afternoon a slice of that slathered in butter with a cuppa would be perfect! And it's all Fair Trade so makes you feel good too!